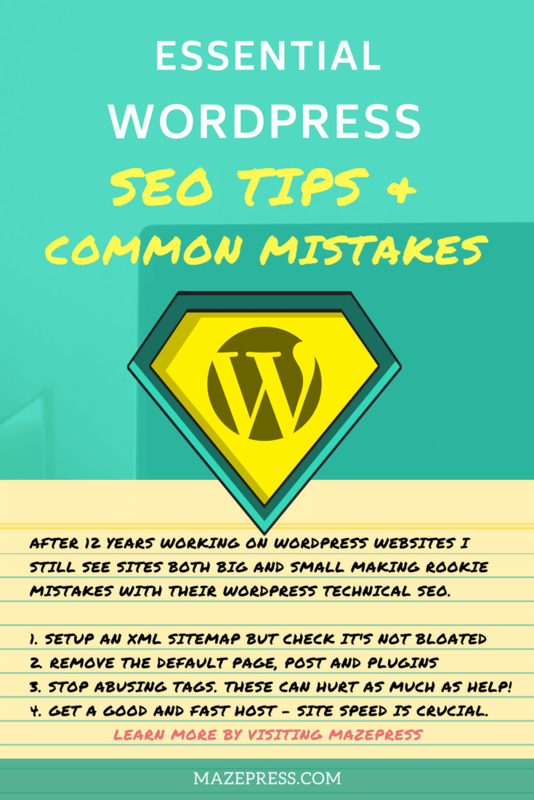 This is a guide I have put together covering the best WordPress SEO tips to help website owners and bloggers who don't know how to optimize their sites or are making innocent yet problematic mistakes. I can't tell you how many websites, even established ones (not mentioning any names) that make some of the most glaringly obvious mistakes with their onsite SEO when using WordPress. I'm going to break these WordPress SEO tips into several groups. When you first install WordPress there are several defaults that are already set. Many webmasters even those with well-established sites are still making some of these mistakes so here's what to remove. Default Plugins - Depending on who you installed your WordPress website with (hosting company) you may have used an installer script that auto-installs several plugins that are of little use. You can deactivate and leave them as they are if you are unsure, or delete them if you know what you are doing. The "Hello World" plugin is a common example but specific hosts do install other plugins you may not need and may slow down your site if you keep them active. Sample Page - This page is created by default when you install WordPress, many webmasters forget to delete it and since this page contains the same content as thousands if not hundreds of thousands of different websites on the internet, it's probably not a good idea to keep it as a page Google can index. I often check large websites sitemaps and find this still exists but these days I am not surprised anymore. So go to pages and delete the sample page as soon as you install WordPress, then it's out of the way. Hello World 'Post' - Similarly to the Sample page and while this is often something people do tend to remove it is still worth mentioning. For beginners the Hello World post that exists under 'Posts' when you first install WP. I think it's best to delete it and create a new post, or at the very least edit your permalink to represent your post title. Don't even think of trying to rank for "hello world". Permalinks - This may or may not affect you but many WordPress installs set the permalink defaults to use the date structure, this means your posts have /YYYY/MM/ in the URL but this is only really useful for bloggers and even then only for those keeping a journal where the date really matters. It's far more SEO friendly if your post URL sits on the root domain 1 level up like this example yourdomain.com/your-post. Go to Settings > Permalinks and select the "Post name" option and hit save changes. Now, this is one of my biggest pet hates. As a web designer I do a fair amount of rebuilds where I take a WordPress website a client already has, assess it, decide it needs a rebuild (95% of the time) and then I discover under Posts > Tags that they have hundreds of post tags many of which contain between 0-1 posts. Firstly, the purpose of a tag is pretty much the same as a category, they are for taxonomizing your content, that means organizing it into relevant groups and the end goal is to make it more user-friendly for your visitors to browse content from a specific topic. So if you have tags with 0 posts or even 1-3 articles then these tags are redundant and not offering any benefit to your visitors. Secondly, in the eyes of Google and other search engines, these would be considered very thin pages with weak content, even if you added a tag description and introduction but my guess is anyone abusing tags this way aren't adding static content atop these archives anyway. If you have 10 amazing pages and then 100 weak tag pages, guess what? Your site quality is massively diluted. Approach it with a less-is-more philosophy when it comes to the number of posts or pages and focus instead on using tags only when absolutely necessary. On this website I don't even use post tags at all, none, zilch, nada! Using the categories feature is enough for my needs and even then the entire number of categories is a not so colossal ten. So let's talk about WordPress plugins that are useful for SEO. I spoke with an author of a magazine recently who asked for a list of all of the best SEO plugins, to which I replied, there really aren't all that many 'plugins' to worry about, and ideally using fewer plugins means your WordPress website is more likely to load quickly which is good thing for SEO since Google likely devalues websites with horrific load times and the fact most visitors are impatient and may bounce. There are however a couple of plugins that impact on-site SEO that I always install and both of them are free. 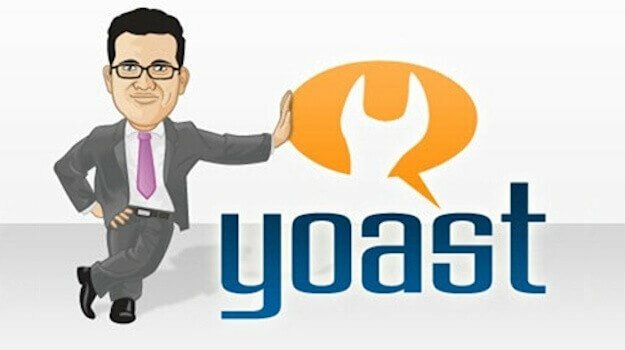 The granddaddy of WordPress SEO, formerly Yoast SEO, now known as The WordPress SEO Plugin this tool really sets the benchmark in the WordPress SEO world and as such deserves the appropriate name. What does this WordPress Swiss Army Knife do? 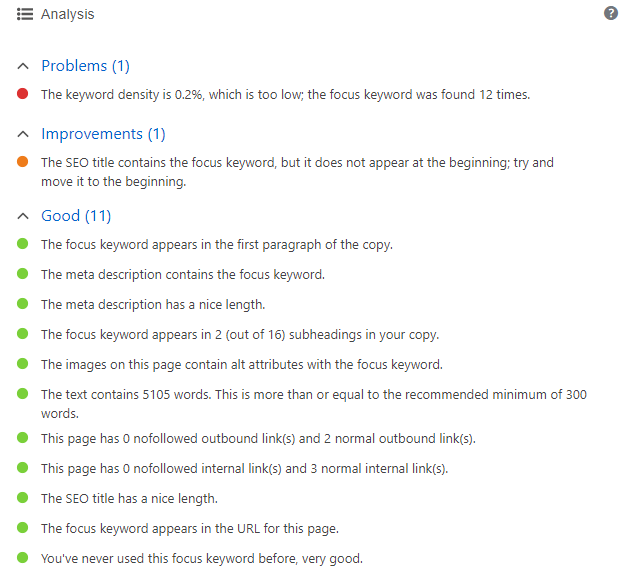 Post & page Onsite SEO analysis and 'Focus Keyword' analysis. Adds markup Schema for various SEO benefits. Includes social features, reviews, and content types. I highly recommend using WordPress SEO plugin and not All in One SEO plugin. I also recommend you don't add any additional XML plugin like Google XML Sitemaps since this is already baked into WP SEO. After you have installed the plugin, here are the settings I pretty much always change or adjust. Having an XML formatted sitemap is an essential for any website. This is like giving Google the blueprint to your house, once you provide a sitemap of your content to Google Search Console / Webmaster Tools you are making it much easier for them to find their way around the content and see the relationships between your various pages and posts. You can turn this option on using the WP SEO plugin by going to SEO and then XML sitemaps in your WordPress dashboard. After that, you will want to customize the sitemap to ensure it only includes the content you want it to. But don't I want all of my pages indexed? Yes, in most cases, but there are plugins and themes that introduce custom post types that are meant for back end purposes but can be picked up by Yoast and automatically indexed. As such you want to make sure you check the sitemap section in WordPress SEO and uncheck any of these instances. You can also do the same for custom taxonomies if you have some of these in existence. Having every individual testimonial indexed as it's own page is not a good idea, but can happen when a testimonial plugin uses a custom post type to function. When you browse to the Titles & Metas section of WordPress SEO you will find a tabbed page that allows you to control a few aspects of each content type and taxonomy available in your WP install. Here we want to look to see if there's any surplus post types or taxonomies worth noindexing. On most installs, I will noindex tags, even though I seldom use them, but will keep them indexed if they are in use. There's also a format taxonomy type that not many webmasters seem to use that you might also want to noindex. Under "Post Types" I will usually noindex the Media / Attachments post type since I don't feel it offers anything to the website and dilutes the quality of the site. Since I also like to use Beaver Builder for the majority of my websites, this plugin introduces some post types and taxonomies that I definitely don't want to have indexed such as "Templates" and if you run a one author blog there's little point having your author archive indexed. On the "Other" tab, I no index "Subpages of Archives" which is the /page/2 and page/3 of your blog index page and can lead to a lot of unnecessary pages being added to the index. One last thing I remove is the data archives as these seldom offer any benefit to me but this isn't something everyone would want to noindex if these pages are popular with your readers and you have been using this functionality for some time. That covers it for the essential changes I make after installing the WP SEO plugin, the next step is to look at how you can use this plugin on an ongoing basis. 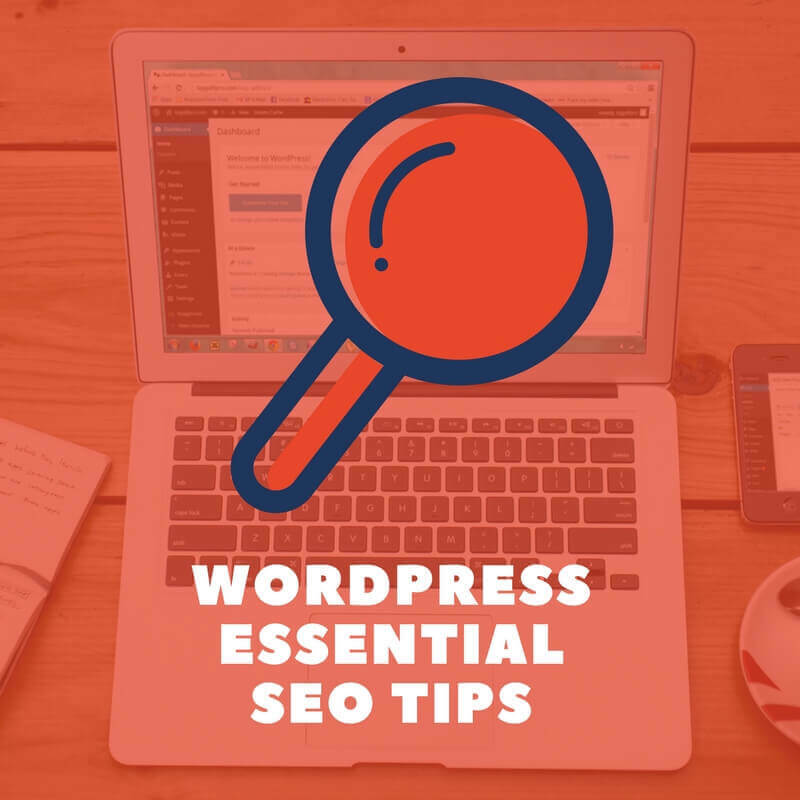 The feature most people are aware of and use with WordPress SEO is the content analysis tool that is available on any edit post or edit page screen. This tool does several things but you can group them into two groups. Onsite SEO Essentials - This analysis tool scans your content and other settings of the page as you fill them in and refreshes to show you what you are doing well and what you still need to look at doing based on a list of essential criteria that includes. The length of the content and reporting if it's long enough or not. Does the post have internal links and at least one external link? Do you have an image in the post and does it have an alt tag? More on this further down in our "content structure and HTML" section. If your permalink contains stop words like "and, the, or"
It also gives you lots of other pieces of information which change and evolve over time that helps you refine the quality of your article. For this reason there's an advantage to writing articles directly into WordPress rather than using a document editor like Word. The second set of content feedback it provides is relative to the focus keyword you specify in the analysis box. Simply add your keyword verbatim, trying not to use something that's too longtail as it will see a low density but making sure to try it with a couple of keywords to get a sense for how you score for more than one search phrase. Focus keyword is the same as Primary keyword and as such should just focus on the main subject focus of your content. Are you linking your focus keyword as anchor text to another page or website? If so you should change the anchor text. Various other ever-evolving SEO checks and recommendations. Here's an example of how that analysis box might look. Whether you run a WordPress website or use another content management system one area you will need to have full control of is redirects. Namely 301 redirects to point old dead pages to new ones, or to create short pretty links for sharing. When an URL becomes redundant. Maybe you had a URL that ended with /best-guide-2017 and that is now outdated, you want to update it to 2018 but all of the traffic and backlinks are pointing to the old URL. So you use a 301 redirect and repair. Ideally, you might want to avoid making this mistake in the first place where possible and have a more holistic view. If you do an audit and decide to remove 20 of your pages because they are no longer relevant, they are low quality or they just don't offer anything to the site you may want to preserve some of the authority they have gained by either redirecting them to the most relevant page you are keeping or just to the homepage if you don't have anything better. You noticed an URL was indexed that shouldn't have been. You might be doing a clean up with Yoast / WordPress SEO plugin and realize you don't want to keep the author page indexed since you are the only author and it doesn't bring anything to the site, so you remove it and 301 redirect the URL. Another important aspect to consider when setting up your WordPress site is selecting a search engine friendly theme. You want to check the last date the theme you want to use was updated, as a theme that was updated recently but not released recently has a better chance of having continued support and improvements to keep it secure and to ensure it benefits from new features added to WordPress core that could help you rank better in the future. It's important to future proof your WordPress website and the most important step you can take in doing so is picking the right theme. Okay so most people aren't going to be able to whip up the code and work out if it's high quality and designed for a fast loading experience but you can look for this when reading a websites sales pitch and feature list or when reading what others have to say in their reviews of a theme. You also want to shop around and look at reviews, reach out to other people you know who run WordPress websites and get their input, and look at websites of sites you like or are influenced by, look at their source code and press Ctrl + F and search for /themes and it will likely reveal the name of the theme they are using. I'm not sure there is a best because some aspects are subjective and outweigh other features, it depends to some degree on your requirements. The majority of the time I use the Genesis framework by Studiopress because it has a strong track record, it's regularly updated, contains clean code, supports a child theme system, adds new features in tandem with WordPress and if course because it's fast loading out of the box. I do also like using BeaverBuilder plugin for easy control over page templates and designs, though that is more for productivity reasons than for SEO benefits. Another important factor to consider is site speed, as I mentioned before keeping plugins to a minimum is essential at least if they do something on the front end and increase the loading time, however, there are a couple of plugins that can help you out. Before we get into that, let's talk about a few common mistakes I see people making that need to be discussed. MASSIVE Images - Yes, at the top of the list the most common issue here is uploading images directly from an iPhone or Android with the notion they are low quality and may not even be good enough for the web. Well, I'm here to tell you it's 2018 and the typical photo size that a phone camera is capable of is about 5X the size of the typical screen width. When that image is uploaded to WordPress (even if losslessly compressed) because of the sheer dimensions of such an image you end up with a 1-5mb image file. That's 1 to 5 megabytes and ideally, the maximum image size you want on a web page is around 100kb, that's 100 kilobytes and 0.1 megabytes to put it into perspective for those that aren't techy. Some images I see on websites are 50X the file size they should be. This makes your website very slow, makes Google dislike you and visitor bounce rates go through the roof. Avoid causing a slow website by not resizing your images to a suitable size. The size exactly will depend on if you want it to span the full width of the web page or just the content width so you will have to check your own requirements and then react accordingly. Typically though an image width of 1600px is more than enough to span the width of your website for most users while keeping the file size down. VIDEO - I will keep this one short as there isn't too much to say other than, don't upload videos to WordPress and expect the playback to be good and for it to not kill your website speed. What you need is a video hosting service, something developed specifically for streaming video content at high speeds. Fortunately, your best friends are YouTube and Vimeo, both of which are free for the majority of the available services and you can use these super fast video hosting services to your heart's content. Upload your video to YouTube, Vimeo or one of the other high-quality video platforms and then you will be able to copy the embed code or just the URL and then paste it into WordPress to display your video. Simple and while this doesn't mean there's zero impact on the speed it will be far less of a burden than self-hosting. Unnecessary Plugins & Themes - When you are first experimenting with WordPress, and you are trying things out it's tempting to use lots of plugins and keep switching themes, and there's no harm in experimenting, in fact, I encourage it, I have spent years experimenting with this stuff and that's why I'm here to save you the burden. The problem is that I often log in to websites where the client has an issue and needs help only to find 3 or 4 plugins that all have the exact same purpose and as a result are adding unnecessary load on the website and also likely conflicting with one another. If you play with a plugin and it's not actually being used in the end, at least deactivate it, or consider deleting it. Security tip - Inactive and unnecessary plugins still need to be updated, which quite frankly is a waste of time, if you don't update them they may pose a security risk, so if you aren't planning to use them again, take the additional step of deleting them. WP Smush - This plugin allows you to losslessly compress image files as you upload them to WordPress or in batch if they are already in your media library. This is definitely a plugin worth having installed. A popular alternative is the TinyPNG plugin, which despite the name also works on JPEG files too. Hosting - I am a big proponent for using services like Bluehost, however, their services are more aimed at beginners and those with a very small business or someone looking to experiment with a new side hustle. Unfortunately, the speeds are not always the best. For an established business, or a website that has already graduated past the incubation phase and is is a profitable online venture I would always advise finding the fastest hosting available. My recommendation for the fastest WordPress hosting is WPEngine for a number of reasons. Their support has always been excellent. They specialize in hosting WordPress websites so understand the ecosystem intimately (oo-er). If your business is generating even just $200 a month online then it's worth checking out WPEngine's personal package at $29 per month as the speed improvement will surely help your SEO and conversions. The only drawback is they don't offer an email service, so you will either need to find an alternative such as Google Apps for Business or your domain registrars email services. These services take the burden of loading all media files away from your server to their far superior content delivery network. This way your hosting just loads the absolutely essential files and database while the CDN delivers all of your media which leads to a much faster loading time. Caching - There are various types of caching you can apply to a WordPress website however the approach you take will vary based on a couple of factors. If you use a hosting company like WPEngine with high-end WordPress dedicated hosting then you will find they have a plugin blacklist, this is a list of plugins that either aren't compatible, are known to be buggy or slow or caching plugins. The reason for the latter is that WPEngine apply their own server-side caching so you don't have to. Therefore if you host with a service provider like this you can likely skip this step but it's worth contacting them to discuss and find out if there's anything you can change or configure. Depending on the theme or set of plugins you are using you might find one of the caching plugins works better for your setup. Popular options include WP Rocket, W3 Total Cache, and WP Super Cache. You can test your site speed on the Google Speed Test site and GTMetrix to get the scores and a list of improvements you can make. Let's talk about content structure and how to markup your content when writing a new post or page. There are a few common mistakes I see regularly that need to be addressed. Headings are those title options you have in the content editor when you click on the drop-down that says "Paragraph" by default. These include H1 through to H6 and there are a few things to keep in mind. Don't use the H1 title within the content, your actual post title is typically displayed in your theme as an H1 already and you only really need a single page title in the same way you would only give a document one main title. If you need large text then speak with your developer. If you are unsure if your post titles are outputting as H1 titles right-click the title in your browser and go to "view source" or "inspect" and then check the code to see if the title is wrapped with an H1 wrapper. Technically with HTML5, each HTML section wrapper can have its own H1 title, however, since your content is all within one section anyway this means you should stick to a single instance. Don't add an H3 title if you haven't already added an H2 title, this is not semantically correct. The purpose of an H3 is to be a subheading of content within an H2 title and following a uniform style makes your content much easier to read.Avoid using headings as a way of visually styling your text. There is a reason the editor limits you to a few options and that is to keep your content more organized and tidy. If you need a custom text size create a custom p class, if that went over your head then ask your developer to create one.Dammit, maybe I will do a post on that someday. If you are interested in knowing how? then encourage me! Another area to consider is "Accessibility" this involves considering all types of people and the various possible impairments and less-abilities people live with around the world. These include people on the autism spectrum, people with low vision or blindness, those who are deaf or hard of hearing and people with mobility issues and also dyslexia. All of these groups of people may experience a webpage or use a computer in a slightly different way. 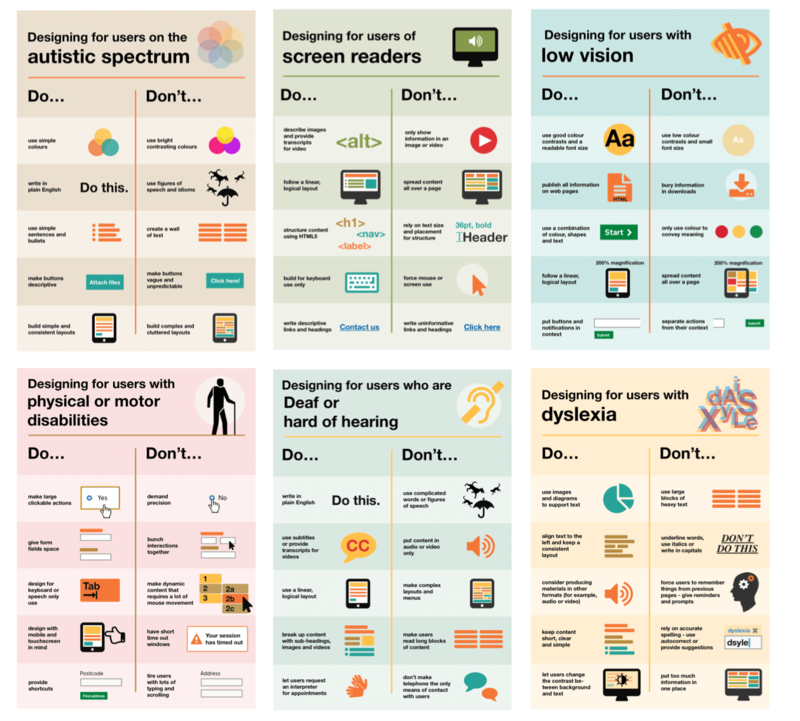 Posters showing the dos and don'ts of designing for users with accessibility needs from the Gov UK. Why does this matter for SEO? Because a lot of people fall into one of these groups and they should be considered and catered for both for moralistic reasons and also because you could be missing out on valuable attention time. If your website is not conducive to people with accessibility needs then they are more likely to click off your page in a hurry and increase your bounce rate. Google has also begun adding elements of accessibility into its quality scoring and advising all websites to abide by a minimum font size, and also cater for mobile users using touch screens that may have motor problems with their fingers, so don't make buttons too small or too close together. This is most problematic with WordPress menus, so consider how the menu looks on a phone screen. Please, please, please don't have a website with a black background and white text or text that's too close to the background colour and barely readable. Clicks X bye-bye. Increased Accessibility leads to increases in "Dwell Time" and that is a factor that definitely improves your rankings. The longer people stay on your web page on average the better quality it must be and Google can easily measure that. Cool Fact: I'm dyslexic, diagnosed at age 8 and it has become something I have learned to wear as a badge of honour. Computers and the internet served as the two fundamental tools that have allowed me to overcome obstacles and spend time learning the things I love and enjoy. This has possibly probably definitely been the reason I wanted to strike it out on my own and take the unorthodox path in life. We touched on these briefly in the Yoast SEO section as this plugin will detect if you haven't added alternative text to at least one image. Alt tags or alternative text is a way of describing the photo with written words, these are useful for accessibility reasons as screen readers use these to audibly tell someone who is blind or has poor eyesight the context of the picture. To add these in WordPress, hover an image and click the edit option, then look for the option that says alternative text and type it into that field and hit update. Google also rewards this behavior and ideally, you should include your primary keyword within the alt text but avoid keyword stuffing and try and make it as descriptive as you would want it to be, try closing your eyes. I once designed and developed a website for a lady in Canada that was completely blind, she was an inspiration and her IT abilities remarkable. She taught me as much as I helped her and so I spent some time testing her website blindfolded and using a screen reader to get into her shoes, there's no way to really understand your customer until you have tried to switch places for a moment. When you are starting a new WordPress blog or website one thing you will want to consider is the value of comments. This depends on the type of website, or blog you have and there are a few arguments both for and against adding a conversational feature to your website but Google has stated that they are a positive form of social proof and does like to see them. Comments can add a lot of value to the discussion and in some cases increase the search engine rankings of a page if the content of the comments adds more depth to the original article turning it into a longer article. Of course, this does require the comments to be on topic and of good quality. Comments can also offer social proofing, when you see people actively discussing a topic or lots of people commending the author on his or her valuable insights but they can also work in the opposite direction if you have a website or blog with lots of posts and no comments on any of the articles over a space of a year or more then this ultimately looks like nobody is engaging with your content. The truth is, some industries find it easier than others to encourage interaction and an active discussion and when people are quickly researching one thing and then onto the next in a heartbeat unless they actually have a question many people will just move on. I have used comments on many blogs and also not used them and my opinions are still mixed on if you should or shouldn't be using comments but if a website already has comments and is actively getting interaction then they are certainly worth keeping. One reason I remove them on some websites is the sheer number of spam comments I get from people trying to promote their link in the comments or just comments that are completely off topic. Cleaning these up and keeping an eye on which to approve or send to the trash can be time-consuming and I decided my time is better spent creating more awesome content but if you ever do want to ask a question you can always contact me, don't worry I'm a pretty down to earth guy. You can, of course, use anti-spam tools like ReCaptcha but they may not prevent all spam and may not work with all comment platforms. In my experience I have noticed the trend of using comments decline gradually over the years, especially with some of the most successful sites and authority figures online. This is not specific to WordPress and has been a security and SEO improvement you have been able to benefit from for a while. However, as time goes on the emphasis on having a properly configured SSL certificate only increases as Google ups the ante in their effort to enforce webmasters to adopt better security. Hold up, what is an SSL certificate? SSL (Secure Sockets Layer) is the standard security technology for establishing an encrypted link between a website on a server and your web browser. This connection guarantees all data that passes between the server and yourself remains private and encrypted. So when you sign in and submit your password, or fill out a form with your credit card details you can rest assured this data cannot be easily sniffed or phished by people of a nefarious persuasion. Traditionally only websites that were transactional required an SSL, eCommerce websites that were processing credit card information or even websites that allowed users to login and thus involved them submitting a password were, of course, the highest priority candidates for using an SSL, in fact if you see a shop without an SSL then don't buy anything from them. This is highly unprofessional in this age. Now, every site should employ this same layer of security due to the potential for hacking and cybercrimes security is key. Fortunately, it's also getting easier to do this yourself and many hosts or domain providers even offer a free SSL certificate. Contact your hosting company AND domain provider and see what they suggest, make sure you wait for both to reply since one may come back to you to say you already have one and just haven't used it. This has been the case for a number of my clients. 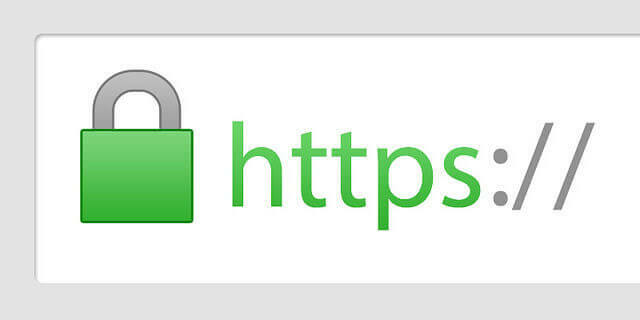 Setting up an SSL is relatively straightforward, once your hosting company or domain provider has properly activated it for your domain, head over to the web browser and type in your web address with HTTPS instead of HTTP. It is likely going to throw an error in the left-hand side of the browse bar to say the page is not secure but this doesn't mean the SSL hasn't been applied and isn't active. Click on the red cross icon and see if the pop down states an SSL certificate is installed and valid. If so you can move onto the next step. In your WordPress Dashboard head over to "Settings > General" and where it says "Wordpress Address" and "Site Address" change both URLs to contain https. If these two fields aren't editable then they must be set in your wp-config.php file. If you can connect to your server via FTP then do so and in the root folder of the website, you will find a wp-config.php file which you need to edit. If you lack FTP access or don't know what this is, you may be able to login to CPanel and use the file manager facility to locate this file. Make sure you take a backup of the file before editing. For some people with a brand new website, the above might be all you need to do. You may need to wait a moment but after refreshing your website you should finally see the green padlock symbol in the address bar, this will show your visitors you are genuine and can be trusted, it also says a lot about your professionalism in this day and age. If you have content on your website that links to other pages both internal and external with an HTTP URL you have a few options. Use the Better Search and Replace Plugin and set the rules to search and replace any HTTP URLs with https URLs. Make sure to do a dry run first and also take a full backup before using a tool like this that permanently replaces tables in your database. Use Really Simple SSL and SSL Insecure Content Fixer plugins which are very simple and easy to install and setup, these work through your content to change URLs where possible for you. That's it, your website is secure and now you can stand side by side with the best in your industry because trust me, they have SSL installed! There are two services that I always recommending installing, this might be basic information to some but there are many beginners still not using proper analytics tools. If you don't know what works and what doesn't in your marketing strategy then how can you improve on your results? Google Analytics allows you to add a simple tracking code to your sites head section (the location of where you add this will vary depending on which theme you use) that allows you to track visitors to your website from all sources. It is, however, a great way to get a rough idea of what pages are generating traffic and how visitors are interacting with the website, like which pages they click through to and demographics of your visitors. If you see a lot of spam or referral traffic in your Analytics then look into setting up a filter to remove any fake bot traffic that may be skewing your results and your ability to interpret the bounce rate. This is an essential tool and just as important as using Google Analytics. While it only tracks your visitors and performance directly from Google Search, the data is more accurate and it gives you great insights into which keywords you are ranking for. You can also use Google Webmaster Tools to discover and get notifications of other website health issues and allows you to submit your sitemap to give Google a more in-depth look at your content. Connect my Google Analytics & Search Console accounts inside the "Admin" section of the Google Analytics interface. The last step allows you to pull data from Search Console into Google Analytics so you can see specific search engine rankings and performance. Handy! If you decide to make a staging site or development site, which means cloning your existing site and moving it to a subdomain like dev.yoursite.com then make sure to noindex the entire install. You can do this by going to "Dashboard > Settings > Reading" and then check the checkbox option that allows you to discourage search engines from indexing. This could save you from a duplicate content penalty or the embarrassment of your visitors finding your development install via Google! Eeeek! There's a lot you can do wrong if you are new to blogging or running a WordPress website. Follow the above steps and you will be in good stead for the foreseeable future. This honestly started out as a short post to save me sending these tips via email for the 10000th time and to go into more depth and bring things up to date. If you have completed all of the above and you are looking for more ways to optimize your website for search engines, why not check out our guide to the best SEO tools you can use to growth hack your website and build more traffic and backlinks in no time or my ultimate list of the best SEO blogs you can use to improve your skills. Related Reading: See my recommended WordPress plugins for your website or blog. I hope you found this content valuable, consider subscribing to our email newsletter below for more information like this and if you have any suggestions you think I may have missed (I'm human after all) then please get in touch and let me know.